Nanday conures are not quiet birds but they make fantastic pets. They are affectionate toward their owners and talented talkers, capable of learning several words and short phrases. It's a medium-sized parrot that is also very intelligent and thrives on being taught fun tricks that are sure to entertain. If you think you can handle a highly vocal pet bird, the Nanday may be a good fit. However, there are a few other things you should know about these smart little creatures before you decide to adopt one. It's interesting to note that ornithologists prefer the common name black-hooded parakeet for this species. Much of this has to do with the fact that there has been some debate on whether it belongs to the conure genus of Aratinga. It now has its own Nandayus genus and there are a number of subspecies. This conure has a vast natural habitat in South America that includes Argentina, Bolivia, Brazil, and Paraguay. They're most likely to be seen in flocks of at least ten birds and prefer the easy food sources provided by agriculture. In the wild, you're more likely to hear their distinct call before seeing the birds because their green color blends well into the landscape. Over the years, quite a few pet nandays have been released to the wild. Flocks of these feral birds can be found near metropolitan areas like Los Angeles, California and Miami and St. Petersburg in Florida. They're a surprisingly hardy bird and feral populations are also known to live as far north as Canada. When fully grown, the nanday conure is barely a foot long. Its maximum beak-to-tail length is between 11 and 12 inches, so it is considered a medium-sized conure. They typically only weigh about five ounces. Nandays are long-lived, with many living to age 20 or older. The nanday is an extremely smart bird that is outgoing. Their size, bright colors, and ability to learn tricks, as well as their social skills, make them a popular attraction for bird shows. One of their best-known tricks is retrieving dollar bills from audience members then finding that same person to return the money to. Nanday conures are a very vocal bird. They will call out early in the morning and later in the afternoon, a natural instinct they use in the wild. They can also be quite chatty when perching, especially if given a person or another bird to talk to. If they learn to talk, the nanday will have a rather raspy voice that does not have the clarity of larger parrots. Some of these birds can develop a vocabulary of about 20 words. These conures are very curious and will explore their environment. They can be restless at times though you'll also find that they enjoy moderate petting and a snuggle session when they get sleepy. One of their more peculiar habits can catch new owners by surprise. They are well-known for falling asleep on their back with their feet sticking straight up in the air. Nanday conures are striking to look at and their dark, black faces are their most distinguishing feature. Their bodies are mostly green with a grayish-blue patch on the chest. The bird's blue tail feathers with dark colors underneath many feathers and a touch of red on their legs make them even more beautiful in flight. They have bare white rings around their eyes, black beaks, and flesh-colored feet. This species is monomorphic, so you will not be able to tell males and females apart. They can be sexed with a DNA test or during surgery. Since they're highly intelligent, nanday conures require a fair amount of socialization and mental stimulation. Owners should plan to spend a few hours every day interacting with their bird because it will need sufficient time outside its cage. Nandays require a cage that is larger than you may think. They will actually do best in one that allows them to fly, which gives them ample exercise when you're away from home. At a minimum, a cage that is 20 inches square and 36 inches high is recommended, though larger is better because this bird really needs to stretch its wings. Conures also enjoy bathing regularly. Your bird will be very happy if you leave a dish of water in its cage and many owners say that a pie dish is the perfect size. While nandays are one of the louder conure species, the noise level can depend largely on whether or not the bird is getting adequate socialization. These birds do sometimes scream and screech for no apparent reason. However, most properly socialized nandays are too busy enjoying life to stop and scream. These birds do very well with multiple people and strangers. Introduce them early to new faces and they will be a very social bird with anyone who walks into your home. In the wild, nanday conures eat a variety of fruits, vegetables, nuts, and berries. For pet nandays, adding high-quality pellets and seeds in equal proportion to this repertoire should ensure your bird is getting all the nutrition it needs. Grapes, apples, broccoli, and tomatoes are favorite foods for this species and these make great treats. They can also benefit from a daily serving of vegetables, particularly nutrition-packed leafy greens like spinach and kale. It's also good to include protein in a nanday's diet. They are omnivores, so bits of cooked egg, lean meat, or fish are okay on occasion. Foods that are toxic to these birds include avocado, chocolate, coffee, and anything with salt. 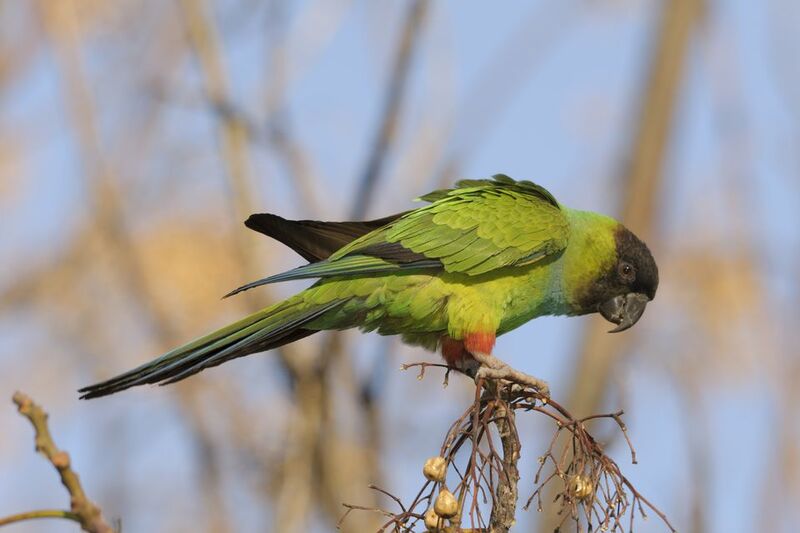 Exercise is particularly important to nanday conures as they are an active, high-energy species. A pet nanday should be allowed a minimum of four hours outside of its cage per day. Since they are so intelligent they require adequate mental stimulation as well. These birds need plenty of toys to keep them occupied and they do like to chew, so be sure to have a good stock available when one gets used up. You will enjoy training your bird to do tricks and he will thrive on the challenges you provide. With positive reinforcement, nandays are quick to pick up new tricks like turning around, waving, and dancing. Before you adopt a nanday conure, check your state and local laws to make sure that you are allowed to keep one. Feral nandays are considered invasive and a threat to native bird species in many parts of the United States, so they are banned in many areas. If you find that pet nanday conures are legal where you live, contact a reputable local breeder and set up an appointment to meet their available birds. Spending time with a few different birds before choosing a pet will help you pick the one that is the best fit for you. Otherwise, check out all of our other parrot species profiles.